Chimney fires can be very dangerous. This task will help prevent them. NOTE: The tasks and timings shown here for your Fireplace (wood-burning) are based on a single-family home (owned), located in Massachusetts, United States, with priority set at ‘1 star' or higher, for all possible goals. If you set your personalization differently in your Home Wizard app, then you may get reminders for different tasks and timings in your recommended home care program for your Fireplace (wood-burning). Typically for $90 to $150 , a professional chimney sweep will thoroughly clean your fireplace and chimney and check for defects. Or you can do the work yourself if you have the proper brushes and vacuums and don't mind the mess or hassle. Inspect for creosote deposits in the flue. If greater than 1/8" in thickness, then the chimney flue should be cleaned. 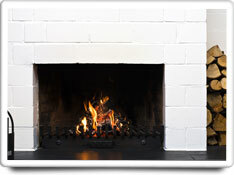 Check the firebox for damaged brick or mortar. Check the damper for operation and snug fit. Also inspect for cracks, pitting or rusted-out sections. Check the flue for broken or damaged bricks on the flue liner. Cracking is a sign that there has been a flue fire and is a potentially serious problem. The benefits of this task are high, as it helps prevent dangerous and costly chimney fires. The cost of this task is moderate, and requires the scheduling of a qualified chimney sweep.